A confocal microscopy image shows a cross-section of a 3-D-printed, 1-centimeter-thick vascularized tissue. Movement toward the development of bone cells through stem cell differentiation can be seen after one month of active perfusion of fluids, nutrients, and cell growth factors. The structure was fabricated using a novel 3-D bioprinting strategy invented by Jennifer Lewis and her team at the Wyss Institute and Harvard SEAS. New research details how scientists are moving closer to embedding vascular networks into thick human tissues, which could result in tissue repair and regeneration — and ultimately even replacement of whole organs. 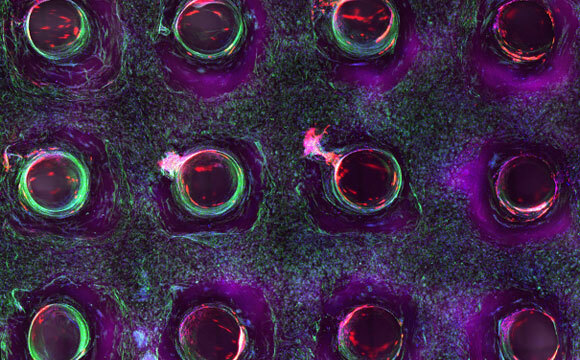 A team at the Wyss Institute for Biologically Inspired Engineering at Harvard University and the Harvard John A. Paulson School for Engineering and Applied Sciences (SEAS) has invented a method for 3-D bioprinting thick vascularized tissue constructs. The vasculature network enables fluids, nutrients, and cell growth factors to be perfused uniformly throughout the tissue. The advance was reported Monday in the journal Proceedings of the National Academy of Sciences. “This latest work extends the capabilities of our multi-material bioprinting platform to thick human tissues, bringing us one step closer to creating architectures for tissue repair and regeneration,” says the study’s senior author, Jennifer A. Lewis, who is a Wyss core faculty member and the Hansjörg Wyss Professor of Biologically Inspired Engineering at SEAS. In the study, Lewis and her team showed that their 3-D printed, vascularized tissues could thrive and function as living tissue architectures for upwards of six weeks. To date, scaling up human tissues built of a variety of cell types has been limited by an inability to embed life-sustaining vascular networks. Building on their earlier work, Lewis and her team have now increased the tissue thickness threshold nearly tenfold, setting the stage for future advances in tissue engineering and repair. The method combines vascular plumbing with living cells and an extracellular matrix, enabling the structures to function as living tissues. As an example of what can be done with the technology, Lewis’ team printed 1-centimeter-thick tissue containing human bone marrow stem cells surrounded by connective tissue. By pumping bone growth factors through supporting vasculature lined with the same endothelial cells found in human blood vessels, the scientists induced the cells to develop into bone cells over the course of one month, according to the study. Lewis’ novel 3-D bioprinting method uses a customizable, printed silicone mold to house the printed tissue structure. Inside this mold, layers of vascular channels made of pluronic (a material that liquefies at refrigerator temperature) and living stem cells are interdigitated like locking fingers. A cellular matrix is poured around this structure, and solidifies. The entire device is then refrigerated until the pluronic turns to liquid and is sucked out by a vacuum. This creates channels through which liquid containing endothelial cells, oxygen, nutrients, and growth factors — basically, simulated blood — can flow. The bioprinted material can be used to create living tissue cultures as well as to drive directed tissue growth such as differentiating stem cells. To achieve a variety of tissue shapes, thicknesses, and composition, the shape of the printed silicone chip can be customized and the printable cellular material can be tuned to include a wide variety of cell types. In other words, this new method creates a fully controllable, living 3-D tissue environment, researchers say. “Having the vasculature prefabricated within the tissue allows enhanced cell functionality at the deep core of the tissue, and gives us the ability to modulate those cell functions through the use of perfusable substances such as growth factors,” said David Kolesky, a graduate researcher at the Wyss Institute and SEAS and one of the study’s first authors. Ingber is also the Judah Folkman Professor of Vascular Biology at Harvard Medical School and the vascular biology program at Boston Children’s Hospital, and professor of bioengineering at SEAS. In addition to Lewis and Kolesky, other team members on the new study include co-first authors Kimberly Homan, research associate at the Wyss Institute, and Mark Skylar-Scott, postdoctoral fellow at the Wyss Institute. The work was supported by the National Science Foundation and the Wyss Institute for Biologically Inspired Engineering at Harvard University. Be the first to comment on "New Bioprinting Technique Shows Potential for Tissue Repair and Regenerative Medicine"